A Fraserburgh art student, who has explored the film making process in his final year project, has seen his work go on display in Aberdeen. 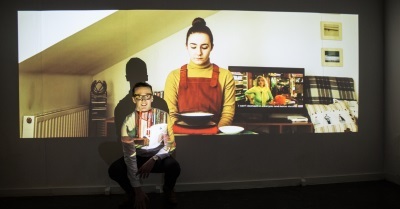 Conor Gault (23), a contemporary art practice student has recently exhibited his final year project at the art school’s Degree Show. The former Fraserburgh Academy pupil has created a three minute film which explores the technical aspects of film-making. His inspiration for the project came from critically acclaimed film makers such as Wes Anderson and Jean-Pierre Jeunet. “I focused on their use of symmetry to entice and fully involve the audience in the worlds that they create,” Conor explained. “This sparked a desire to learn more about how these worlds were created, leading me to quintessential directors such as Hitchcock, Truffaut, Godard, Tarantino, P.T. Anderson and Jeunet, and their individual uses of cinematic techniques. Speaking of his time at Gray’s, Conor said: “Gray’s for me has been challenging. Being mindful that mistakes weren’t necessarily failures was key to my progression through the mediums made available by the CAP course. I discovered that I was absolutely useless at sculpture and printmaking, and found that my work manifested itself best in the medium of moving image.